There are many Montego Bay tours and attractions ready to captivate you who are planning a vacation to the heart and gem of the island of Jamaica. Here is a list of some of the most exhilarating and exciting tours. Montego Bay Jamaica being the tourist capitol of the Caribbean and a tourist hotspot, is full of excitement, fun and adventure. With the right blend of peace and calm making this place a true haven for you wanting to enjoy an exciting getaway. Whether you like water sports, enjoy seeing new places or just wanting to lie down on the white sandy beaches and enjoy the cool sea breeze. MoBay has everything to offer that you can imagine in a perfect holiday. There are many tours operating out of Montego Bay, each with it's own special destination plans and packages. These tours help you choose the kind of adventure and sightseeing you want to enjoy. Montego Bay Tours list some of the most exhilarating and exciting tours to help you plan your vacation ahead and get the most out of it. This tour takes you on a journey in a semi-submersible vessel, called the Coral See, to the colorful world of underwater marine life and fishes of the Montego Bay Marine Park. The area's beautiful coral reefs, rich flora and fauna is seen close up. Montego Bay's turquoise waters are gorgeous to look at both above and below the surface. You will enjoy panoramic vistas of the reef through the windows in the vessel while being in an air-conditioned environment. Montego Bay Tours guide will answer all your questions and provide you with details about the marine habitat. Try something different on your vacation. If you love adventure and fable tales, wanting to get away from the world for a couple of hours, these two rafting tours are perfect for you. Rafting on the Martha Brae tour and the Rainforest River Tour, are part of the Caliche Rainforest and Adventure tour group. 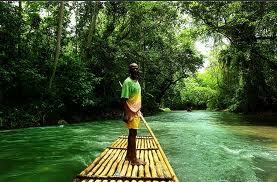 Best suited for children and those looking for a peaceful ride on a large raft gliding on the river. 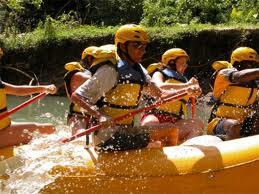 The other part of the Caliche Adventure tour, Canyon White Water Rafting is for those looking for an adrenaline rush. You will get to ride down waterfalls, through huge boulders and through Grade II-IV rapids in a totally undisturbed part of Jamaica. Offering some of the wildest and most adventurous excursions you will ever experience. This tour combines many activities according to your taste and liking. Be it horseback riding, 4x4 off-road safaris, river kayak safaris, buggy ridding on rough terrain, ATV riding or tubing. There are different types of tours for everyone who knows how to enjoy life to its fullest. If you are an adventure lover then Jamaica Zipline Adventure Tour is for you. 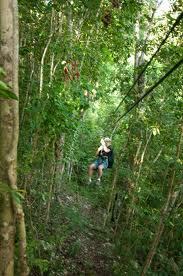 They offer the longest ziplines in the Caribbean, from 250 ft to the longest one, called Big Timba, being 1600 ft long. This tour also includes the 250 ft long Jungle Bridge and 6x6 rides through the jungle. Do come and enjoy this adventure. 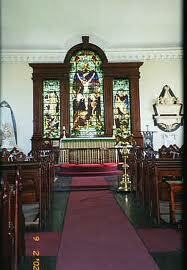 St. James Parish Church located on Church Street, is regarded as the finest church in Montego Bay. It is also the housing for a number of notable marble monuments. The beautiful interior of this church is mostly noted for its stunning stained-glass window just behind the alter. 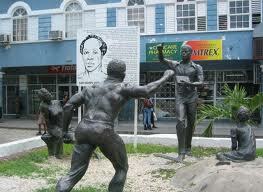 This 1.5km walking tour presents to you the rich Jamaican culture and historical landmarks. Starting at The Dome and ending at Sam Sharpe Square. The bustling cobbled Sam Sharpe Square is named after our national hero the Right Excellent Samuel Sharpe, the leader of the 1831 Christmas Rebellion. 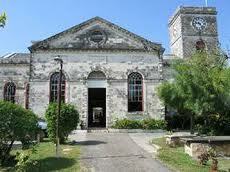 The Civic Center is a handsome colonial style cut stone building that contains the informative Museum of St. James. It has relics and other exhibits tracing the history of St. James Parish from Arawak days through the slave rebellions to the most recent past. The colorful past of Montego Bay can be seen still alive in the buildings, structures and relics all over the city. If you want to continue walking you can head north about 800m to Gloucester Ave, which has attained the name 'Hip Strip' famous for dining and music. The above information is just a handful of the best Montego Bay tours and this city has plenty more to offer. With its rich cultural history and vibrancy, coupled with fine dining it is a holiday experience like no other. Montego Bay is the best destination for your vacation.